Situated in western Guangdong province, the xian of Kaiping was one of the centres of Chinese emigration in the nineteenth and twentieth centuries. 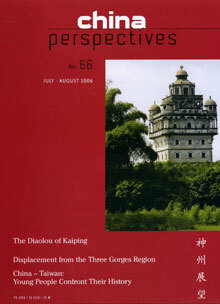 This article is concerned with the diaolou built there at the end of the Empire and in the early years of the Republic. These fortified buildings were built with money from emigrants, trying to protect their village at a time when public order was very uncertain. They are notable for their combination of Chinese and Western architectural features. The Three Gorges dam project has caused the displacement of many people. Among them, three identified groups have arrived in Shanghai. Originally from rural areas in the municipality of Chongqing, they have all been settled on the outskirts of the city, where they have been given a home and land. This article considers those who have arrived on Chongming Island. It highlights, through their situation, the problems that these forced migrants are having to face, and the limits of the government’s planning when many new plans for relocating people, both in urban and rural areas, are being developed in China. In mainland China, the family, as the basic social unit, has recently regained its importance in economic activity. Starting from the particular case of a family business located in Zhejiang province, this article reviews the practices that prevail in the succession of the management of companies. Following this case study, a questionnaire was drawn up and submitted to 17 family businesses. The criteria applied by the entrepreneur in the choice of his/her successor, the order of preference among the candidates, and the methods of controlling the risks involved are revealed and analysed. This article considers definitions of semi-presidential systems, distinguishing prescriptive criteria (constitutional regime) and descriptive criteria (political system). Applying prescriptive criteria to the Taiwanese situation, it concludes that the Taiwanese Constitution prescribes a semi-presidential regime. The article then analyses the descriptive features of Taiwan’s political system. The conclusions are enhanced by a close analysis of the situation in the aftermath of Taiwan’s 2004 parliamentary elections and also from the events in the spring of 2006 (the delegation of constitutional powers and recall motion). Taiwan’s political system exhibits both very strong majoritarian and delegative tendencies, the main reasons for the lack of functionality under the present constitutional regime. That the political system is resistant to change means, for this article, that the only possibility for democratic government functionality for Taiwan is a change of constitutional regime to one that is parliamentary.